I am now six months out from my race. I would love to say that things have gone swimmingly, but I feel like I need to be honest in this blog. The last month has been a rough one for training as I hit physical and mental blocks. The good news is that I, have found a path around them and feeling back on track – I’ll discuss this more later in this post. The chart below is my training which I am now grouping by week since the daily level is too small to be legible. There isn’t a key but blue is biking, yellow is swimming & green is running. You’ll also notice some red (surfing) and dark green (stationary bike trainer) on the 2nd duration chart – those don’t have distances though so they aren’t on the first chart. Setbacks are a part of any training plan. It would be foolish to expect to increase the strain on your body, mind & schedule for months at a time without there every being any unplanned difficulties. Usually setbacks are recoverable or adaptable. A cold might take you out for a few days, but then again, the rest was probably good for you. A minor injury might require you put less stress on a foot, but you can supplement with cross-training and keep to schedule. There are however setbacks that hit in such unison that they result in the perfect storm. A combination of setbacks, each recoverable or adaptable on its own, but in combination, catastrophic. 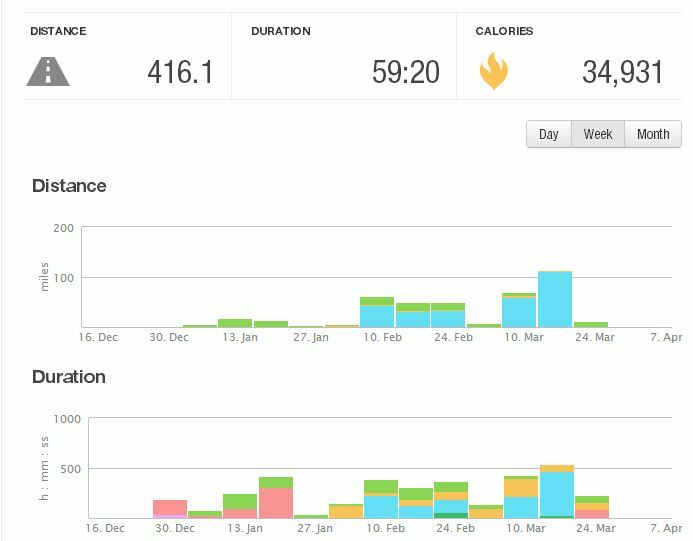 The following was the perfect storm of training setbacks I endured during February-March. I write this not as an excuse or to seek pity, but to accurately share my Ironman training experience and the steps I’ve taken to stay on target. The most frustrating has been an ankle injury I sustained while playing snow football on Super Bowl Sunday. It seemed to heal quickly and so after a week off I got back on it as you can see below. The problem is it never seemed to heal completely and so as March rolled around I decided to really let it rest, cutting my running workouts down to zero or one per week. The next limiting item is a persisting rotator cuff injury from a few years ago. I have mostly recovered from it but don’t know if I’ll ever be 100%. I was strong enough that I could paddle into Mavericks earlier this year and so I haven’t shied away from swimming. When my ankle was hurt I decided to switch out a few running workouts for swimming workouts. This is a standard adaptation I’d done many times before when training for running races. The problem was that my shoulder needed a little extra time to recover between workouts and as I started swimming two or three days in a row it began to get aggravated. Struggling with two sports, I hoped to turn to the third. Unfortunately cycling is the most difficult sport to fit into a busy schedule. Of the three sports, cycling workouts take the longest to complete and they are also the most limited in terms of availability. For safety concerns I only bike outside during daylight hours when it isn’t raining. Those slots became surprisingly hard to come by mid-week. The final two training setbacks, (though I am hesitant to refer to it as a setback of any kind) was the birth of my first child. We ended up having to spend just shy of a week in the hospital, unplanned. I had thought we’d be there for maybe one night and so I didn’t break any sort of gear with me – not that I had much time or energy. Part two of having a child is returning home happy & healthy. I quickly learned how valuable free time becomes with a newborn in the house. My cousin joked with me recently that his last marathon was 7 year ago and that it wasn’t a coincidence that his oldest child is 7. When tested with setback, it is our ability to find getbacks that determines our success. The following are the ways I have tackled/am tackling each of the setbacks listed above. I have been paying very close attention to my ankle over the past month to figure out what’s up with it. I’ve had sprained ankles before and this seemed a bit different. I had taken to wrapping it during the day to reduce the load on it during my normal walking around at work. I eventually picked up on the pattern that it never really hurt after running but did hurt after a few days of not being wrapped. My current suspicion is that I actually injured my arch which is causing my foot to pronate while walking which is making my ankle feel sore. To fix this I put some orthotics inserts into a few pairs of my shoes to provide extra arch support and I am only going to wear those shoes for the time being. I’ve realized that for now I’m just going to have to limit my swimming workouts to twice a week. The good news is that I’ve been able to slowly increase the distance I’m swimming and can now comfortably get 3.5 miles into those two days. In a few months I might increase swimming to three days a week as I start to double up. Once I realized we were going to be in the hospital for a while I realized my planned training was going to be impossible so my goal was just to minimize the negative impact of missed days. On day two, I had a coworker bring by some running gear I had in my desk so I could at least get my heart rate up. I ended up getting in two short runs in, two-three miles each. I’ve found in the past though that even two miles will help maintain fitness a good bit as opposed to missing a whole week, which can result in noticeable decreases in fitness. Finally, while I’m sure there were paths I could have explored to help fit training in with the busy schedule of a new dad, the actual solution I’ve implemented is one I can’t take credit for. 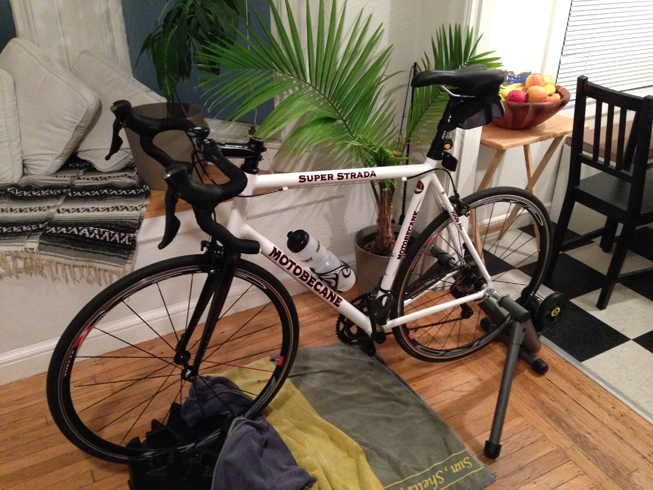 My wife has been amazing about helping to prioritize my training and allowing me to take time to get workouts in. That is the only reason I’ve been able to train as much as I have. It also helps that our son loves sleeping and has to date been fairly low maintenance compared to the babies of friends I’ve talked to. I do make sure to pitch in though, below I got caught on camera doing a last minute diaper change just before I left for a ride.